This $7.5 million project executed by AEAI for USAID aimed to strengthen the institutional framework for policy decision-making in the energy sector and focused on expanding capacity of efficient generation, transmission, and distribution assets. Key results included helping 12 power utilities improve generation and distribution services affecting 20 million customers; implementing the immediate repair and construction of >800 MW of hydroelectric and fossil fuel-fired power plants; and providing technical inputs to enable USAID analyze projects for funding (e.g., due diligence for four hydropower projects). AEAI’s work included: providing advisors to the Ministry of Water & Power, National Electric Power Regulatory Authority, Alternate Energy Development Board, Planning Commission, Ministry of Petroleum and Natural Resources, Ministry of Finance, Water & Power Development Authority, and Ministry of Environment to: assist in the implementation of the Power Sector Reforms Program, recommend solutions to overcome constraints and barriers limiting the development and implementation of an Integrated Energy Policy for Pakistan and increased power generating capacity. AEAI provided technical support to AEDB for the development and finalization of new Medium-term Renewable Energy Policy and Environmental Impact Assessment (EIA) guidelines for wind and other RE resources; assisted NEPRA in the analysis of tariffs, subsidies, and incentives to achieve more rational power pricing and tariff structure; assisted NEPRA and publicly-owned power distribution and supply companies to devise and implement a tariff strategy to facilitate a transition to cost-of-service based rates, competition, development of alternative energy resources, efficient consumption of electricity, increased generation from conventional energy resources, and greater private sector participation; and assisted NEPRA and DISCOs to implement energy rationing and demand-side management programs. The project successfully supported six thermal-fired and hydropower generating plant projects totaling $135 million in investment, including about $75 million of USAID-financed energy equipment; supported 363 MW additional capacity through expansion and rehabilitation projects; assisted four power generation and transmission entities to pinpoint efficiency measures, streamline tariff petitions, and make credible business plans; trained 116 sector engineers, technicians, and managerial staff in both public and private sector organizations; assisted three generation companies to draft business plans, which led to solicitation of private management contracts; and prepared critical sector documents, i.e. : the Medium-term Alternate and Renewable Energy Policy, technical audits of GENCOs, Cost-of-Service Study, Tariff Subsidy Study, Rationalization of Economic Use of Gas, O&M Study for GENCOs, EIA guidelines for wind projects, the Energy Section of the 10th Five-Year Plan, Step-1 Due Diligence of Diamer Basha and Kurram Tangi generating projects, LNG Study, Step 1 Due Diligence of Warsak generating project, an Environmental Management and Monitoring Plan, Public Private Partnership Study, and NTDC’s Business Plan. AEAI was subsequently awarded a follow-on $15 million project to continue these activities, increased in 2012 to $80 million in order to expedite generating capacity expansion. 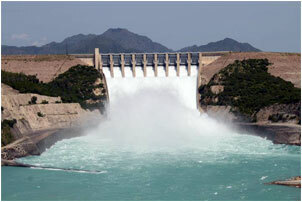 Policy Project (EP-EP): Tarbela Dam Rehabilitation Project.